It was a week of devastating lows and mild highs for Community Board 2. With NYU virtually assured of getting their 1.9 million-square-foot expansion plan through City Council next week, in spite of vigorous local objection, the mood at last night’s executive board meeting was decidedly grim. 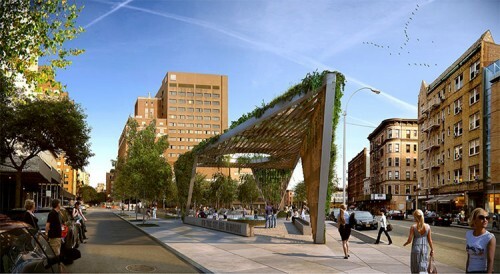 But a new design for the AIDS Memorial, to be incorporated into the proposed St. Vincent’s Hospital Park across the street from the former hospital site in Greenwich Village, offered some hope. The new design was in response to a demand that the designers incorporate community input, providing hope for some that that the Uniform Land Use Review Procedure (ULURP) was not a waste of time. “With ULURP being ULURP, I didn’t think this would happen,” Village resident Robert Woodworth said of the memorial designed by Brooklyn-based studio a+i. View of the AIDS Memorial from Greenwich Avenue looking north. The vote was nearly eclipsed by a visit from Council Member Margaret Chin who came to explain her position on NYU to the polite but angry crowd. Board Chair David Gruber didn’t mince words, telling the Council Member that the vote earlier this week was “monumentally tragic” in its disregard for the community. The frustration with NYU made the memorial’s evolution that much more poignant. Community member Steve Ashkenazi drew a direct comparison. “This group has responded to the community,” he told the crowd. 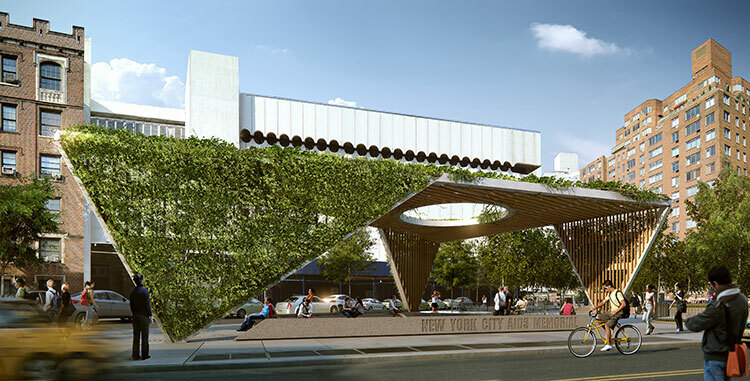 “It’s a beautiful, relevant design.” Strange as it may seem, the memorial and NYU do share commonality, both the modest AIDS Memorial and NYU’s huge expansion plan bid high in their initial proposals and eventually whittled the scale down after negotiating with the board. 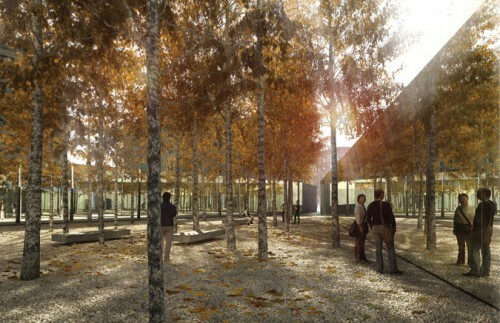 Studio a+i’s winning entry to the international competition for the AIDS Memorial enclosed much of the square. 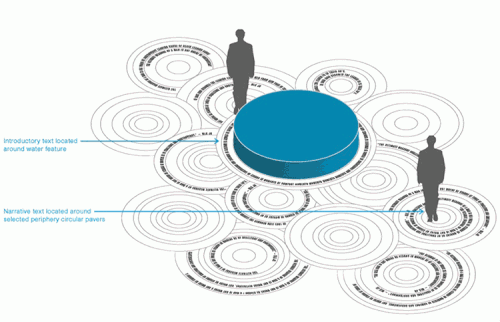 Entrants were charged to dream big and included the use of an underground space for a museum. An oculus sits just above a reflective water element. Indeed many had thought that a+i’s winning design resulting from the ideas competition, sponsored by Architizer and Architectural Record , would be realized as it was presented, encompassing the entirety of the triangular park. But as it tuned out, site-owner Rudin Management had a plan of their own for a much smaller park. Under the banner of the Queer History Alliance, activists rallied media support for an AIDS memorial on the site, even as the board was trying to influence the design underway by Rudin’s landscape architect M. Paul Feiedberg. In the process the site for the public park evntually expanded to encompass the entire triangle, with 17,000 square feet set aside for the memorial. Poems by local poets will be caved into stone adjacent to circular pattered pavers. The memorial’s planted overhead canopy will mimic the angles formed by West 12th meeting Greenwich and is supported in turn by three inverse triangles. Cross beams of planters will run the width of the triangles, holding English Ivy, Virginia Creepers and Honeysuckle. Slats running opposite the planters will hold a galvanized Greenscreen grid, giving the vine a surface to grow on. 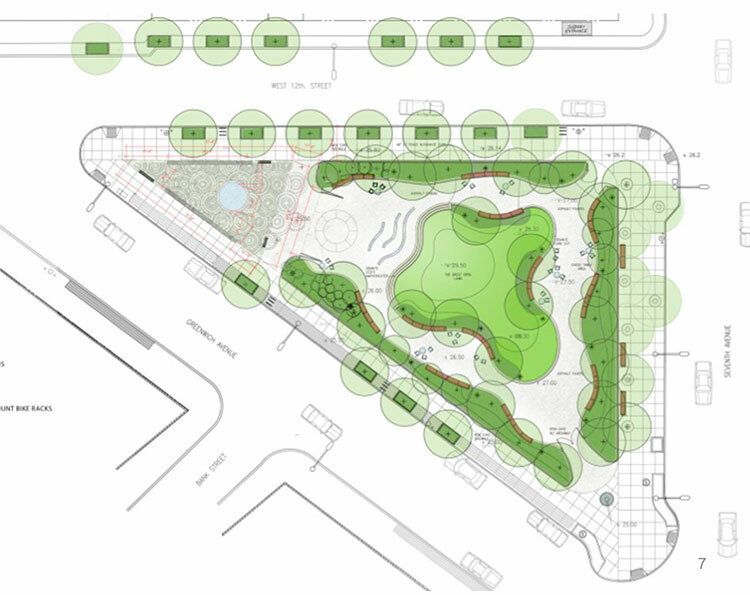 A large oculus will hover above a reflective water element and granite benches will run along the north and south border. Under foot, carved poetry texts find their way in a series of large intersecting circular pavers. Lighting, planting, and irrigation systems include a detailed plan for maintenance. A side view of the memorial from Greewich Avenue. The memorial’s co-founder Chris Tepper told the crowd that the compromise, which led to a much smaller memorial than the winning proposal presented last spring, still meets the group’s “policy goals.” He promised that he and co-founder Paul Kelterborn would remain committed to raising the $2 million for the memorial as well as $500,000 for a maintenance fund. In a first exclusive look, New York Magazine‘s Justin Davidson gave the project a thumbs up. With such media savvy, there is little doubt that the the group, now officially called the AIDS Memorial Park, will have trouble raising the funds to build. The evergreen ivy canopy for the memorial will rise 18 feet above the sidewalk. A view of the memorial from 12th Street. The proposed “St. Vincent’s Hospital Park” incorporates the AIDS Memorial on the west side of the site, represented here by the gray triangle at right.